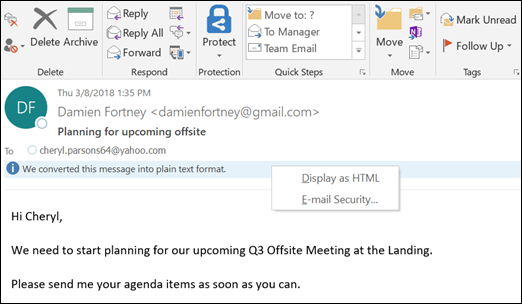 Formatting, pictures, and links can be turned off for all messages that you open in Outlook. Under Read as Plain Text, select the Read all standard mail in plain text check box. To include messages signed with a digital signature, select the Read all digitally signed mail in plain text check box. Note: If you want to view a plain text message in its original format, click the InfoBar, and choose Display as HTML.